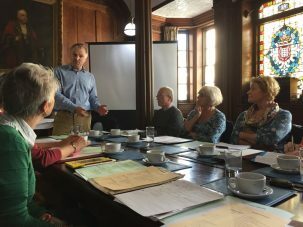 In September and November 15 volunteers met at Harwich Guildhall with Martin Astell from the Essex Record Office to learn about how to record oral history interviews. As part of Resorting to the Coast we are recording 25 new interviews about stories and memories of the seaside heritage across Tendring coast. We invite you to share the memories of your seaside holidays in Tendring, whatever your age. We are mapping your stories on our memory map so that others can enjoy the heritage of the coastal towns of Tendring. What did you look forward to the most on your holidays? The holiday romance, the dancing at the Blue Lagoon in Clacton, a breezy dip in Frinton-on-Sea, an ice cream on Walton pier, roller-skating at Dovercourt skating rink, the donkey rides at Jaywick Sands? 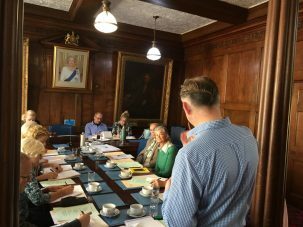 Perhaps your business revolved around the tourism industry – a thrifty landlady, a pleasure boat worker, a winkle seller, an entertainer at the many theatres across Tendring? Your memories will be preserved as a piece of this Tendring coastal heritage and not be washed away like sandcastles in the tide! If you’d like to tell your stories we’d love to hear from you.